Verdemar… the lament of despair, cried over her dead body, over her dreamed-up but never real coming back. 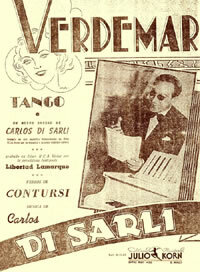 The 1943 tango of Di Sarli’s, with the letras by Contursi, is one most of the saddest and most heart-wrenching classic pieces of the Golden Age. Classic – and of the most mysterious ones at the same time. Verdemar, the aqua green-blue tint of sea water, also known as turquoise, is a very unusual nickname for a girl. Was she for real? How did she die? The other unusual color in the verses, the yellow of her hands – is it a medical symptom, a clue of sorts? Jaundice? El Señor del Tango Carlos Di Sarli, was also cruelly known as El Tuerto (the One-Eyed) in BsAs, where he was considered a yeta, a jynx by his contemporaries, for his dark sunglasses hid his surviving eye as well as the one lost to a childhood gun accident. Intriguingly, Verdemar is dedicated to his dear friend and a distinguished ophthalmologist, Dr. Ernesto Bernasconi Cramer… and the lyrics, as if speaking to an ophthalmologist, tell of pupils rather than the more usual “eyes”. Is it a clue to the true story? Could a white road taken by the searching spirit hint at a real Bahia Blanca (White Bay), Di Sarli’s hometown? We could never figure it out. Oh, your eyes are overflowing with silence! Why your fate so soon turned so ruthless and cruel ! On your lips, kiss of mine has been killed by the cold. And now… What course will I follow? Tis the soul which foretells your coming home. Szabi in the Hungarian version suggested that ʻamarillo’ could derive from the word ’armenius’ (just like Italian ʻarmellino’), and thus referring to ʻmalum Armeniacum’, apricot, so the color of her hands could be rather positive than negative. But in Corominas’ Spanish etymological dictionary, ʻamarillo’ comes from Latin ʻamarus’ (more precisely, its Middle Latin form ʻamarellus’ documented in Hispania), so it has indeed much to do with death. Interesting! I couldn't find a way to translate armellino as a fruit though, all I get is an animal (weasel?). The regular words for apricots, both in Spanish and Italian, seem to from Arabic which in turn must have taken it from Latin "precocious" i.e. early-harvest variety. Although, as it has been recently discussed @ languagehat, Semitic languages have a similar root, "bkr" early / firstborn (as in albacore tune which I just made into poke yesterday). So you think amarillo and amargura are indeed related (and so maybe the link goes not to apricot but to another related Rosaceae, the almond)? On the web, many subscribe to another theory, that it is derived from amber, Arabic anbar... And then I found yet another amarillo or rather amaryllis, apparently a name of Greek origin. Corominas in his prestigious Spanish etymology derives it from amarellus, and establishes an etymological connection to the color of the dying person’s skin in medieval medical theory. Corominas is not on the net, but is quoted in this post which also points out that the derivation of ʻamarillo’ from ʻambar’ is improbable, because in this case ʻmb’ should have been conserved in Portuguese ʻamarelo’, just as the ʻmb’ group is throughout conserved in Portuguese. The Greek connection was proposed by Covarrubias already in 1611, and although amarillo/amaryllis is an alluring etymology, it is absolutely not documented, whereas ʻamarellus’ in this context is, already from 919. Yellow derived from the bitterness of bile makes most sense, yes. Still surprises me because the examples of reverse derivation (from color yellow to bile to bitterness) are so much more familiar. Greek chloro => chole => melancholy or Russian желтый => желчь => желчный etc. Of course all these yellows and golds and желтый - золотой - зеленый ascend to the same proto-IE root and sometimes it may be hard to posit what meaning came first ... but at least it must have started from the colors, rather than from bodily fluids. In the early 90s I read a comparative study of color names in different languages. It pointed out that most Indo-European languages have an ancient common stock of “basic color” names – primarily red, black, white, and a unified green/blue/gray hue, if I remember well –, and all the other colors were named later, almost “ad hoc”, in different ways in the different languages, and often taking their names from the object being most conspicuously of that color (e.g. Italian ʻazzurroʻ from lapis lazuli, ʻmarrone’ from the large chestnut of the same name, etc.) ʻAmarillo’, in Corominas’ view, may follow the same mechanism.